By the courtesy or Mr. C. A. Park, M.Inst.C.E., carriage superintendent of the L. and North Western R., we are able to illustrate the latest type of 2nd and 3rd class dining cars which he has designed. Like the 1st class sleeping carriages (illustrated in the Railway Engineer, February and March, 1899), and also the new 1st class dining carriages are 65 ft. 6 ins., and are we believe, the longest and finest carriages in the country. The carriages are mounted on six-wheeled bogies having a wheel-bas of 11 ft. 6 ins., and which are 42 ft. from centre to centre. The underframes, bogies, wheels and axles, brake and draw-gear are standard for all the three types of carriages mentioned above, and as considerable numbers of each have been turned out of the company’s carriage works at Wolverton, considerable economy must have resulted from this standardization of design. The carriages under notice are divided into three principal compartments and two lavatory compartments, viz. :—the 2nd class dining saloon, for 18 passengers, 20 ft. long, and the kitchen 18 ft. 1&half; ins. clear. The lavatory compartments are 3 ft. 6 ins. and 3ft. 9 ins. long respectively. The kitchen is divided into the kitchen proper and the bitler’s pantry. The width of the carriage is 8 ft. 6 ins. wide over the body. The carriage has vestibule ends and the usual central gangway. 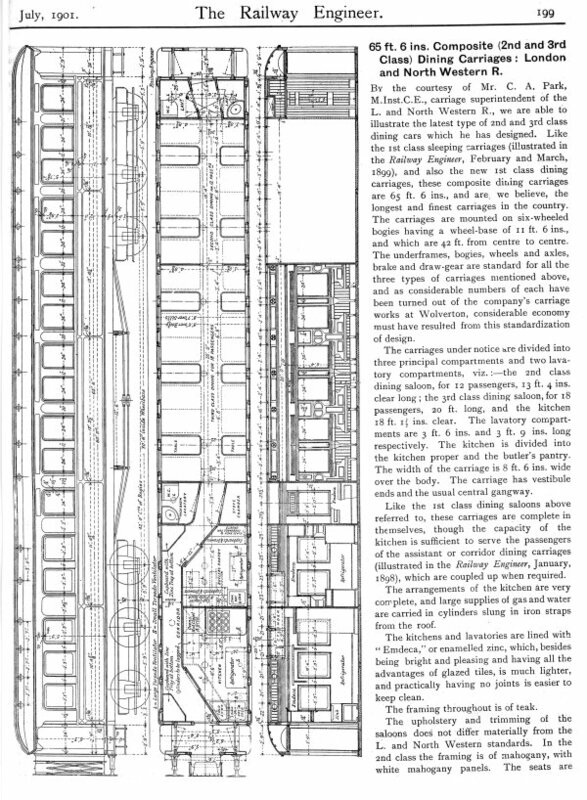 Like the 1st class dining saloons above referred to, these carriages are complete in themselves, thought he capacity of the kitchen is sufficient to serve the passengers of the assistant or corridor dining carriages (illustrated in the Railway Engineer, January, 1898), which are coupled up when required. The arrangements of the kitchen are very complete and large supplies of gas and water are carried in cylinders slung in iron straps from the roof. The kitchens and lavatories are lined with “Emdeca,” or enamelled zinc, which, besides being bright and pleasing and having all the advantages of glazed tiles, is much lighter, and practically having no joints is easier to keep clean. The framing throughout is of teak.